In recent years, there has been more research done into causes of and potential treatments for miscarriage, but there remain many unanswered questions. Just what should researchers be looking at in the area of miscarriage? What should the research priorities be? The Miscarriage Association (M.A.) has been involved in a partnership to decide which areas are the highest priority for miscarriage research. 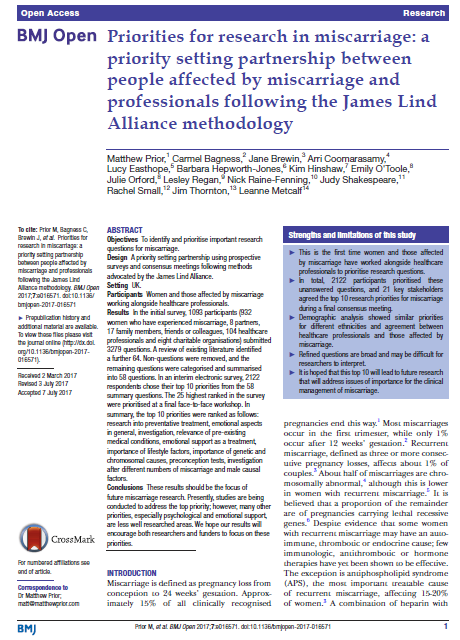 The project was run by the James Lind Alliance and involved other charities, healthcare professionals and researchers, as well as the M.A.. This work has now been published and here is a short summary. In total, 1,093 people (patients, health professionals and charities) submitted a total of 3,279 questions that they feel need to be researched (called “uncertainties”). We then worked to bundle similar questions together. We then asked people to prioritise the 58 “bundled” questions – and 2,122 people contributed to this phase of the project. Finally, a meeting took place to finalise the top ten questions. What are the emotional and mental health impacts of miscarriage in the short and long term for the mother and the partner? What types of emotional support are effective in preventing or treating women or their partners after a miscarriage? Do lifestyle factors (e.g. diet, stress, exercise, weight, alcohol, sexual activity, smoking) cause miscarriage? To what extent do genetic and chromosomal abnormalities in the fetus cause miscarriage? What are the appropriate investigations for women after one, two, three or more miscarriages? What male factors contribute towards the cause of miscarriage? You may be surprised that “Why did I have a miscarriage?” was not the top question. This is because it is such a broad question, it doesn’t help researchers know what question to ask and how to direct their research. Many of the top 10 do ask that question, but in a more specific way, which hopefully will lead to researchers choosing to study that question. Of course, my personal top ten was not the same as our collective final list, but many of my own priorities made it through. For me, preventing miscarriages happening is crucial, and this is well reflected in the list, including the number one. The emotional effects and how to effectively support those experiencing miscarriage are also high on the list. I hope that this list will inspire and encourage more research into miscarriage. This should then lead to treatments and ways to reduce the risk of miscarriage, and to provide better support for those experiencing miscarriage. I am proud to have been able to contribute to such an important project. The Miscarriage Association would like to thank the James Lind Alliance and the University of Nottingham for their support and funding for this project. We are especially grateful to Dr. Matt Prior from the University of Nottingham who led the project and worked hard to get it published. Our sincere thanks also to all those with personal experience of miscarriage who contributed their thoughts and their time to the project.